I’ve lived half of my adult life in New York (and a few other cities) but my allegiance to my hometown team, the Washington Redskins, runs deep. And as any die-hard hometown fan can tell you, we Redskin fans have suffered! Not quite like the plight of many other world-wide catastrophe’s but we’ve wringed our hands, yelled at the field, and sweated bullets for the win. This was certainly evidenced this past Sunday in the game against my adopted hometown team, the New York Giants. Here’s my take on what my beloved Redskins are doing to insure building a winning culture so, like their fight song says, they may “hail victory.” Whereas both teams’ efforts were riddled with errors, disappointments, turnovers and even a feud, there are takeaways that can be applied to building a unified team. Coach Gruden, labeled a “player’s coach,” recognizes that not everyone is going to be happy all of the time yet he’s created a 2016 culture for the Redskins whereby players feel free to game plan as well as feel free to show dissatisfaction if they disagree. He’s taking a risk and he’s availing his players the opportunity to take a risk. The ‘Skins have a lot of coalescing still to improve on as a team but it’s being instilled that the culture is one of risk taking. There are a bevy of young aggressive difference makers in this years’ ‘Skins team. Defensive end Ricky Jean Francois said, “I almost had to take heart medicine,” as he witnessed the pass from Tress Way to Quinton Dunbars on a fake punt. 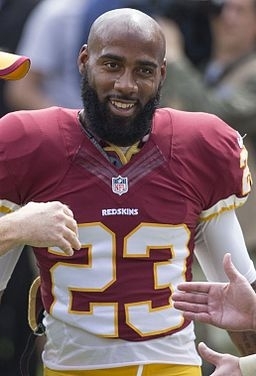 The resilience for the win can perhaps be credited to the leadership of DeAngelo Hall who called a players-only meeting Saturday night. He rallied his teammates with a rousing battle cry and told them “we’re not leaving New York without a victory.” And he continued to echo the cheer from the sidelines even while sustaining a badly injured knee.